"There's nothing quite so refreshing as mangos! Preparation time: 5 minutes. This recipe is from The WEBB Cooks, articles and recipes by Robyn Webb, courtesy of the American Diabetes Association." Neither my daughter nor I liked this at all. Will not make again. I loved it! Much better when frozen. 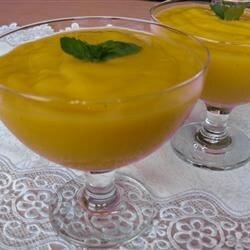 I made it because I love mangos, and will make again because it tasted so great! We drank it as a smoothie. Great! Excellent! Nice and cold and good for hot summer days. It's nice and healty too. Excellent flavor and healthy dessert! I think it tastes even better if kept in the freezer for a couple of hours. Thanks Robyn! This is not mousse but smoothie!